As with social organization, the mating system of cal-litrichids is quite variable, both within and between species. 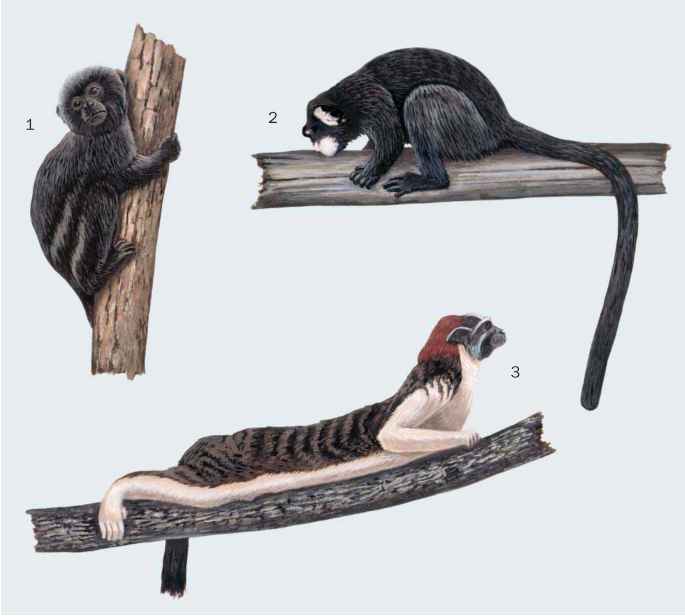 In all marmosets and tamarins (once again with the exception of Goeldi's monkey) each group includes only a single breeding (dominant) female, which may mate with a single male (monogamy), or with two or more males (polyandry). While monogamy is found in all callitrichids, polyandry has been observed in saddleback and moustached tamarins, golden lion tamarins, Aripuana marmosets, and pygmy marmosets. 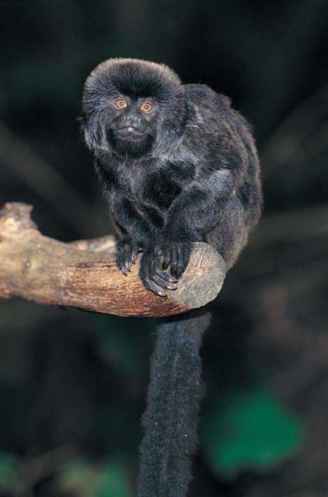 Breeding by multiple females is the norm in Goeldi's monkey, but also occurs in different tamarin species, in golden lion tamarins, and in common marmosets. In golden lion tamarins, secondary breeding females are usually the daughters of the primary breeding female, but their rearing success is much lower. In common marmosets, dominant females have even been observed committing infanticide; that is, actively killing the infants of other breeding females in their group. This behavior has been related to the competition for resources, particularly helpers for infant care. dominant female's interference with matings between subordinate females and males in golden lion tamarins. It has been suggested that olfactory cues (pheromones) released by breeding females through scent marking "suppress" ovarian cycling in subordinate females. However, the presence of ovarian cycles in subordinate females and of multiple breeding females in groups suggest that the mechanism is much more complex and that subordinate females play an active role in determining whether or not they will breed. top tamarin males are able to detect the receptive period through olfactory signals, and it is likely that the same is true for other species and in the wild. Golden lion tamarin males increase their body mass in the month before the highest probability that females come into estrus, and mustached tamarin males have larger testes during the months when most conceptions occur. In captivity, all callitrichids may give birth twice per year. However, in the wild this has been observed regularly only in marmosets and in pygmy marmosets. In most tamarins and in golden lion tamarins normally only one birth per year occurs. In these species, births peak during 2-3 months, mainly in the early and middle wet season. 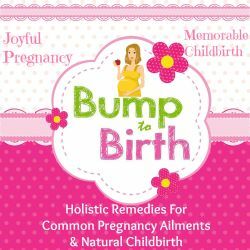 Through this timing of births, the energetically costly lactation and carrying of infants and the critical process of weaning take place during periods of high fruit availability. In golden lion tamarins, a female may give birth a second time only if the first birth took place early in the birth season. 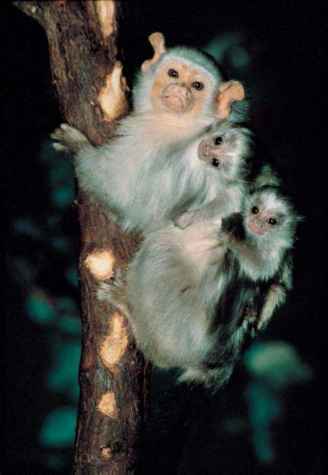 tamarins, it is the adult males who carry the infants most of the time, often from the day of birth on, while in lion tamarins and common marmosets infant carrying is more evenly shared between mothers and fathers or other adult males. In Goeldi's monkey, infants are first carried by group members other than the mother only from about the second week of life on. Carrying the heavy offspring is a strong, energetic burden. Studies of captive cotton-top tamarins have shown that carrying males may lose up to 10% of body mass in the weeks after the birth of infants, even though they do not have to travel and search for food. 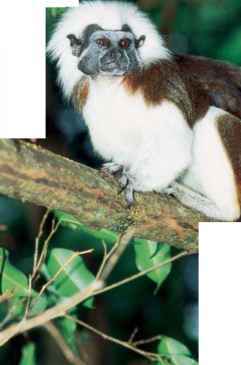 It is thus evident that in the wild, where tamarins may have to travel 0.6-1.2 mi (1-2 km) per day to find sufficient food, infant carrying represents a considerable cost to the caregivers. In pygmy marmosets, infants may be "parked" at protected places after the second week of life, and may spend most of their waking hours on their own. This behavior is unique among simian primates (while many lemurs, lorises, and tarsiers park their infants routinely), and only feasible because the activities of pygmy marmosets are usually focused around a single major food resource. Infant callitrichids make the first short excursions from the back of a carrier and take the first solid food during the third or fourth week of life, but continue to suckle milk from the mother until the end of the third month. Locomotor independence is also attained by the end of the third month, although even at a later age infants may be picked up and carried by an adult group member in threatening situations or when the group has to travel very fast. Apart from carrying, the cooperative rearing system of cal-litrichids includes the transfer of food from adults and subadults to infants. Infants approaching another group member and emitting a squawk, and then taking the food item, can initiate this transfer. In a number of species (e.g., golden lion tamarins and in buffy-headed marmosets, Cal-lithrix flaviceps), animals in possession of a food item may also initiate the transfer; that is, a specific chattering vocalization is emitted in order to attract the infant. Items transferred include animal prey or opened fruits that are otherwise difficult for infants to process. The frequency of food transfer and the willingness of the food possessor to concede decrease with increasing age of the offspring and cease after the first year of life. Sexual maturity is attained between 12-24 months of age; marmosets (except pygmy marmosets) and Goeldi's monkey are matured at an earlier age than tamarins and lion tamarins. How often do geoffrey marmosets breed? 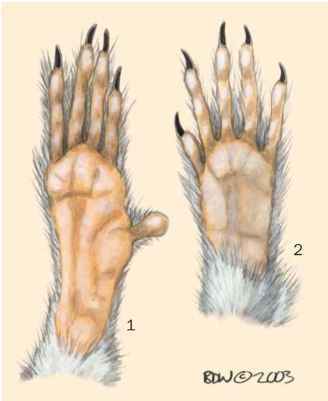 Why do goeldi monkeys have claws instead of nails?